2C-B-FLY is a psychedelic phenethylamine of the 2C family. It was first synthesized by Aaron P. Monte. 2C-B-FLY is 8-bromo-2,3,6,7-benzo-dihydro-difuran-ethylamine. The full name of the chemical is 2-(8-bromo-2,3,6,7-tetrahydrofuro[2,3-f] benzofuran-4-yl)ethanamine. It has been subject to little formal study, but its appearance as a designer drug has led the DEA to release analytical results for 2C-B-FLY and several related compounds. Other related compounds can also be produced, where the alpha carbon of the ethylamine chain is methylated, the amphetamine derivative DOB-FLY can be made, this compound being the dihydrodifuran analogue of DOB, or conversely can be viewed as the saturated derivative of Bromo-DragonFLY. Where only one methoxy group of a 2Cx drug is cyclised into a dihydrofuran ring, the resulting compound is known as a "hemifly", and when an unsaturated furan ring is used, the compound is known as a "hemi-dragonfly". The larger saturated hexahydrobenzodipyran ring derivatives have been referred to as "butterfly" compounds. The 8-bromo group can also be replaced by other groups to give compounds such as TFMFly. A large number of symmetrical and unsymmetrical derivatives can be produced by using different combinations of ring systems. Because the 2- and 5- positions (using phenethylamine numbering scheme, 1,5-positions if numbered as benzodifuran) are not equivalent, all unsymmetrical combinations also have two possible positional isomers, with different potencies at the various 5-HT2 subtypes. Isomeric "Ψ"-derivatives with the oxygens positioned at the 2,6- positions, and mescaline analogues with the oxygens at 3,5- have also been made, but both are less potent than the corresponding 2,5- isomers. The symmetrical aromatic benzodifuran derivatives tend to have the highest binding affinity at 5-HT2A, but the saturated benzodifuran derivatives have higher efficacy, while the saturated benzodipyran derivatives are more selective for 5-HT2C. A large number of possible combinations have been synthesised and tested for activity, but these represent only a fraction of the many variations that could be produced. 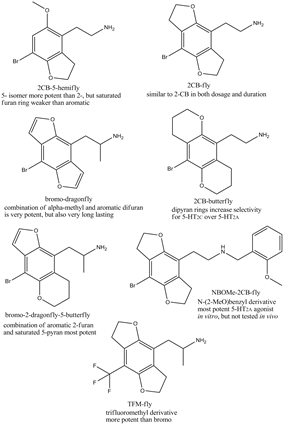 Alexander Shulgin lists a dosage of 2C-B-FLY at 10 mg orally. 2C-B-FLY produces psychedelic effects that last 6–8 hours, or up to 12 hours in larger doses. The toxicity of 2C-B-FLY in humans is unknown. Two deaths occurred in October 2009, in Denmark and the United States, after ingestion of a substance that was sold as 2C-B-FLY from Haupt-RC, but in fact consisted of Bromo-DragonFLY contaminated with a small amount of unidentified impurities. 2C-B-FLY is unscheduled and uncontrolled in the United States. However, it may fall under the scope of the Federal Analog Act if it is intended for human consumption given its similarity to 2C-B. The hallucinogenic effect of 2C-B-FLY is mediated by its partial agonistic activity at the 5-HT2A serotonin receptor, but 2C-B-FLY also has a high binding affinity for the 5-HT2B and 5-HT2C serotonin receptors. ^ Monte AP; et al. (September 1997). "Dihydrobenzofuran analogues of hallucinogens. 4. Mescaline derivatives". Journal of Medicinal Chemistry 40 (19): 2997–3008. ^ Chambers JJ, Kurrasch-Orbaugh DM, Nichols DE (August 2002). "Translocation of the 5-alkoxy substituent of 2,5-dialkoxyarylalkylamines to the 6-position: effects on 5-HT(2A/2C) receptor affinity". Bioorganic & Medicinal Chemistry Letters 12 (15): 1997–9. ^ Nichols DE; et al. (January 1991). "2,3-Dihydrobenzofuran analogues of hallucinogenic phenethylamines". Journal of Medicinal Chemistry 34 (1): 276–81. ^ Monte AP; et al. (July 1996). "Dihydrobenzofuran analogues of hallucinogens. 3. Models of 4-substituted (2,5-dimethoxyphenyl)alkylamine derivatives with rigidified methoxy groups". Journal of Medicinal Chemistry 39 (15): 2953–61. ^ Parker, MA (1998). Studies of perceptiotropic phenethylamines: Determinants of affinity for the 5-HT2A receptor (PhD. Thesis). Purdue University. ^ Chambers JJ, Kurrasch-Orbaugh DM, Parker MA, Nichols DE (March 2001). "Enantiospecific synthesis and pharmacological evaluation of a series of super-potent, conformationally restricted 5-HT(2A/2C) receptor agonists". Journal of Medicinal Chemistry 44 (6): 1003–10. ^ Whiteside MS; et al. (October 2002). "Substituted hexahydrobenzodipyrans as 5-HT2A/2C receptor probes". Bioorganic & Medicinal Chemistry 10 (10): 3301–6. ^ Chambers JJ; et al. (July 2003). "Synthesis and pharmacological characterization of a series of geometrically constrained 5-HT(2A/2C) receptor ligands". Journal of Medicinal Chemistry 46 (16): 3526–35. ^ Schultz DM; et al. (June 2008). Hybrid" Benzofuran–Benzopyran Congeners as Rigid Analogues of Hallucinogenic Phenethylamines""". Bioorganic & Medicinal Chemistry 16 (11): 6242–51. ^ Evans, Paul (2000). Design and Synthesis of Novel 5-HT2A/2C Receptor Agonists (PDF) (PhD.). University of Wisconsin-La Cross. ^ Heim, Ralf (2004). Synthese und Pharmakologie potenter 5-HT2A-Rezeptoragonisten mit N-2-Methoxybenzyl-Partialstruktur. Entwicklung eines neuen Struktur-Wirkungskonzepts. (PhD.). Der Freien Universität Berlin. ^ Silva, Maria (2009). Theoretical study of the interaction of agonists with the 5-HT2A receptor (PhD.). Universität Regensburg. ^ "Erowid 2C-B-Fly Vault: Death Report".